Long, long ago when I was in high school, and learning to drive ::: there was a certain Saturday when my boyfriend of the time was supposed to pick me up to go to the Renaissance Fair.. but after I’d taken a psychedelic substance in anticipation of the occasion, he phoned me to say we couldn’t go after all, because of car trouble. So there I was, high at home.. and my dad said — ‘well then, a perfect opportunity for a driving lesson’. A bit of panic ! Who wants to go practice-driving with their dad when they’re high on LSD ? ! I tried begging off but he said ‘GET IN THE CAR, NOW!’ And so I went, a relatively inexperienced new driver, trying to be ‘normal’ while high on acid, driving in the car with my dad. . yikes ! But surprizingly it went ok –I pretty much kept my mouth shut and I didn’t drive up a tree or anything! and by the way–on a stick-shift ! My dad never knew I was spaced out on acid that day. . . so now these many years later it’s a funny memory… now that my dad has passed on. Yeah.. it was kinda like this ! 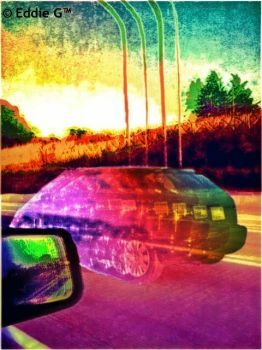 This entry was posted in fun / humor and tagged Driving high on LSD. Bookmark the permalink. OMG :)) This is some experience!! I suppose the adrenalin your brain generated counteracted somehow the effect of the acid and the inner trip. Anyway, it’s fortunate your Dad and you did not get any harm. but I wouldn’t recommend it to anyone ! Glad you were able to driving even under those colorful, wavy conditions and no accidents happened. I have a friend who was high on pot, as a teenager, and his mom came bursting in his bedroom and asked him to drive her somewhere important. (She didn’t know he was high!) He said that was quite an interesting drive…high…with his mom… Ha! actually I wasn’t totally spun, I’d always been afraid of too much.. but still there was impairment. The dumb things we do as kids, eh ?